This brief provides perspectives on the benefits of partnerships between governments and foundations. 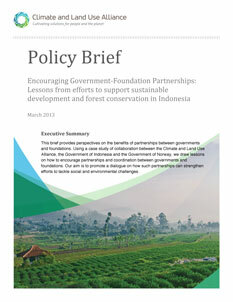 Using a case study of collaboration between the Climate and Land Use Alliance, the Government of Indonesia and the Government of Norway, we draw lessons on how to encourage partnerships and coordination between governments and foundations. Our aim is to promote a dialogue on how such partnerships can strengthen efforts to tackle social and environmental challenges.